Summary: Sixteen-year-old Jill has fought in dozens of fencing tournaments, but she has never held a sharpened blade. When she finds a corroded sword piece on a Caribbean beach, she is instantly intrigued and pockets it as her own personal treasure. Our review: Imagine taking a walk one day and finding an object on the ground. Out of curiosity you pick it up and look at it. Intrigued by the possibilities of the object's history, you keep it, only to be accidentally transported back in time to when this object was of great importance, sought after by pirates, especially the one who crafted it himself. 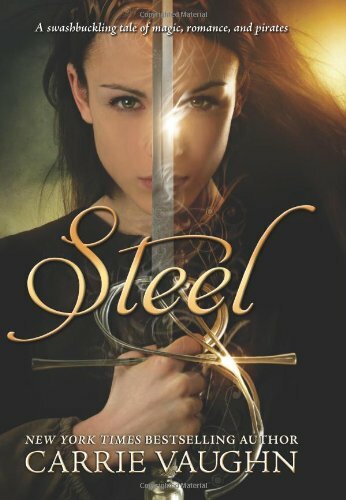 Steel had a unique premise which greatly appealed to me and the cover was kicking. The story itself didn't grab me--at first. Vaughn did a nice job setting up the story and describing the settings. I felt the Caribbean sun rays on my skin as I sat on the boat with Jill and her vacationing family. When she falls overboard and winds up back in time aboard an 18th century pirate ship helmed by a woman--Captain Margory Cooper--I really took notice of this book. At this point the story's pace picked up for me and I was totally hooked. Jill, still smarting from placing fourth at a fencing competition, realizes swordplay is the only way to defend oneself in this day. She thinks, in her naive way, since she's an experienced fencer, she can fight 'with the guys' and show off her serious chops. But when she comes up against the street smart and experienced Henry, a teenager himself, Jill learns the true importance of wielding a real sword as a means to staying alive as opposed to winning a playful student match are two different things. The realism smacks sense and truth into her and she takes her rapier lessons from Henry to heart. As the story progresses, Jill has to remain with the pirates if she is to figure out how to return home. She has to swab the decks and work for her miserly meals and board while sailing the high seas. The captain takes a personal interest in her, taking the sixteen year old under her tutelage, and this friendship takes on an important role revealed later on. My mateys, I will not spoil this book, so I will say when Captain Cooper reveals to Jill that the one who forged the sword she now has the tip of is none other than the dasterdly scoundrel Captian Blane, I felt the story turn up the entertainment notch to overdrive. Determined to find Blane and get him to help her go home, Jill begins to mature, turns less self-serving, and believes more in herself. Kudos to Vaughn for crafting an intelligent pirate novel aimed at young adults and imbuing it with a timeless story of self revelation and awakening. 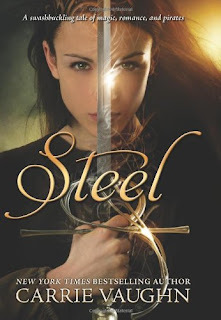 With a feminist spin I thoroughly enjoyed, Steel aptly captured the magic of those old Errol Flynn swashbuckling movies, added a teen heroine, and a touch of historical relevance coupled with the author's lovely prose. Steel was an entertaining, fun read. Read my favorite excerpt below and see why I loved how she created a dance between those two conveyed through the pacing of her words. My only regret was the lackluster romance between Jill and Henry, but since we knew she couldn't remain behind in his time period, their time together was sweet enough and served a purpose. I also expected a bit more on the 'magical' aspect of Blane's sword. My rating: Really enjoyed this book. Favorite excerpt: "He beat her blade, she beat back, and the fight was on. Attacking and counterattacking, he tested her. He was careful, calculating, his movements simple and precise. Textbook, which she wasn't sure she'd expected from someone who by all accounts was a hardened villain. Maybe she'd expected the sweeping, flailing attacks of a movie swashbuckler. But Edmund Blane had had training, and he practiced. He drew her responses, and she fell into the expected pattern, as if they were drilling. She was dancing to the tune he played. She stumbled back, out of his reach, to break out of the pattern and reassess. She circled, aware of Blane's followers around the torch-lit clearing where they fought. They could strike at any moment as well. Cover comment: Like I stated earlier, this cover kicks! Love the pose of the model, the way she holds the sword, and the determined look in her eyes (she also has a bit of mischievousness in there as well). We've got this book out on loan from the library too and plan to read it soon. Glad to hear it doesn't disappoint! I know a little about fencing and this story looks quite intriguing--using your athletic skills to fight for your life. The cover is pretty awesome! After reading Voices Of Dragons I'm really hesitant to buy another book by this author though. That book disappointed me so much. Perhaps it's time I gave her another try though! Thanks for the recommendation. I hope you enjoy the book, We Heart YA and Jennifer. As with so many books I read mixed reviews for this, but I liked it. Heather--borrow it from the library if you can. I do that because I can't buy every book and it allows me to sample authors.